About 125 people came to the Hannah Community Center last night for a two-and-a-half hour discussion about racism in our community. A panel of six African-American area residents covered many issues, including East Lansing’s diversity but lack of inclusivity, the absence of African-American teachers in East Lansing High School (ELHS), and a failure on the part of many white people to fully understand the myriad ways inequity manifests itself in this left-leaning town. One of the panelists was Alex Hosey, the ELHS freshman who sparked an ongoing public dialogue about the experiences of African-Americans compared to those of white people in East Lansing’s history and present. Last night, Hosey read his essay “Why I Sit,” which called upon the City to confront its history of racist housing discrimination and which called upon ELHS to teach that history along with the broader history of racism in America. After receiving a standing ovation for his essay, Hosey said he was “happy and proud” that East Lansing has now formally passed a resolution apologizing for its complicity in housing discrimination. He also told those gathered that he was working with the ELHS Social Studies Department to produce a new curriculum on a new history curriculum that will educate area youth about the kind of active, intentional discrimination his own grandparents experienced when they sought to move to East Lansing to give themselves and their children a good future. 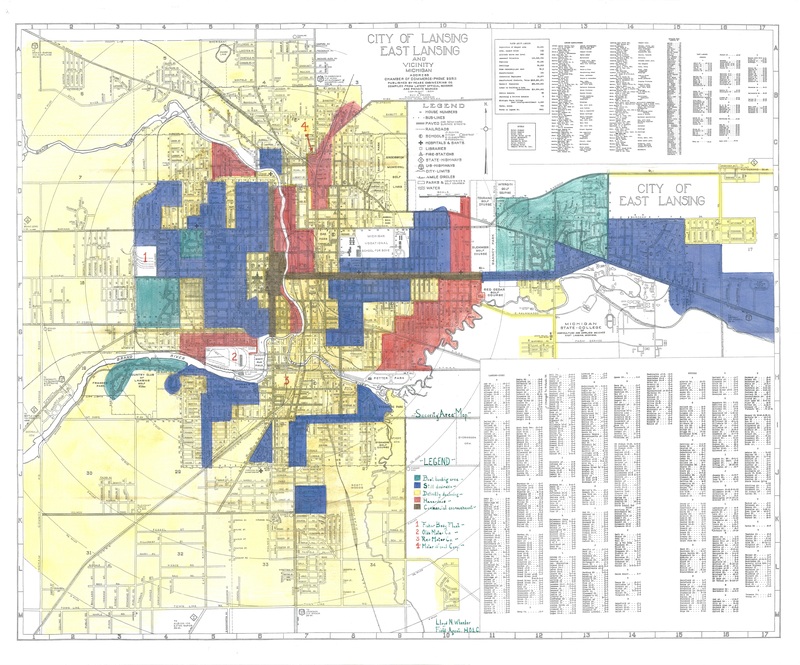 As Hosey spoke, next to him on a screen was projected an image of a historical map of the Lansing area called an HOLC map, from which the term “redlining” comes. In the 1930s, these maps were produced at the request of the Federal Home Loan Bank Board by the Home Owners’ Loan Corporation (HOLC) and were designed to indicate levels of “investment security” for making mortgages. Green districts were considered very secure investment areas, blue “still desirable,” yellow “definitely declining,” and red “hazardous.” Red areas were where black people lived. Lenders denying black people mortgages while real estate agents and others prevented them from moving to “white” areas set up radical economic inequalities that became ever more magnified over generations. As Hosey spoke of the ways in which systematic inequalities of wealth and opportunity persist, the map projected next to him was not the only physical reminder of East Lansing’s racist past. The gathering occurred in the community center named after MSU President John Hannah, who was known for his work promoting civil rights at the national level but who, at home, played a less courageous role. That type of disjuncture—between attitude and action—was named by last night’s moderator, Dorinda Carter Andrews, as still being present and problematic. Carter Andrews called on those in the room, particularly those with white privilege, to examine policies and procedures to see where racism is institutionalized. The event was hosted by the City of East Lansing and the City’s Human Relations Commission, and the panel included Ron Bacon, an East Lansing resident who has served as Chair of that Commission. Bacon is a professional in the biotech and pharmaceutical industries and also serves as Secretary of the Greater Lansing MLK Commission. Bacon told those in attendance that while things are “absolutely” better today than in the past, he remained concerned that the room was packed with liberals who would feel good about themselves simply for attending an event like last night’s. He said he was tired of talk and wanted to see real action, “otherwise it is wind chimes”—pleasant noise with no substance. One thing a number of panelists asked was that white people give up the myth that they are “colorblind.” Another was that they call out racism when they see it happening, and not just go silent or, worse, later pull aside a black person who had been subject to racism to focus on how badly the white witness was left feeling. Ta-Tanisha Manson is an attorney and Grants & Contracts manager at the Michigan Public Health Institute, and lives in East Lansing with her husband who is a Lansing Police officer. From the dais, she recounted how, when she was a student at MSU, she was accosted by a group of white MSU men students at a local Quality Dairy, with one of them calling her the n-word. One came in to the store to privately apologize for his friend’s language, but he did not appear to say anything to his friend. Panelist RoJe Williams, now a senior at Lansing Catholic High School, relayed the experience of being asked about whether his chosen shoe style was “a black thing” and also being suddenly, without warning, called the n-word in a school locker room. Williams is one of the “Lansing Catholic Four” football players who have been subject to extensive backlash, and also praise, for kneeling during the National Anthem. He explained that the locker room experience left him feeling embarrassed, and that his mother had to explain to him that he was not the problem. Manson ended up reporting the racist comment, which led to the coach’s temporary suspension and an apology. But it also resulted in added stress for Manson and her daughter when another coach suggested, in her follow-up comments, that the real problem was that the complaint was made to people in positions of authority, above the coaches’ heads. In the end, the coach was positioned as the victim, which, Manson said, effectively negated the apology. Hosey expressed how radically uplifting it was for him to have a black man as a teacher in 7th grade, but it was noted by him and others that while ELHS now has an African American principal in Andrew Wells, there are no black teachers in the entire school. Jasmine Lee is a graduate of the ELHS class of 2003, having since earned a M.S.W. and Ph.D., who now works at MSU. Lee spoke of what it was like to live with her family in East Lansing’s Whitehills Estates and to have police cars follow her, her boyfriend, or her family members into the neighborhood, as if they did not belong there. Her uncle is a police officer, she said, so she understands there are many good people who are officers, but she found it exhausting to be treated by some officers like a trespasser in her own neighborhood. The panel appreciated her remarks, and many panelists spoke about how they feel they have to code-switch in East Lansing, changing their verbal personal expressions like “It’s about to be on” when they are out in public. Sophia Simon spoke specifically to this. Simon is graduating from ELHS this year and is a highly distinguished student awarded for both her academic excellence and public service. Simon moved from Lansing Public Schools to ELPS in sixth grade, and, she says, she “noticed a huge cultural change from the first moment” of coming to Whitehills Elementary School. “I really put up a huge front,” she said, adding she “created a version of myself that was more palatable and acceptable” to white peers, teachers, and administrators. Simon said she recognized that everyone has to adapt themselves to succeed in social situations—to “wear a mask”—but, she noticed, people of color are required to change themselves much more to succeed in white cultural systems. Simon will be attending Northwestern University starting this fall. She said she’s becoming more clear about the need to change systems at ELHS to stop requiring black students to be the ones expected to change in order to reduce overt racism. Lee recalled ELHS as “an incredibly diverse community,” but said, “we never interacted – it was an incredibly segregated school,” in terms of both race and socioeconomic class. She said that part of the problem that perpetuates racism is that people don’t recognize how “we are all indoctrinated into white supremacy”—good and bad people alike—and that it takes conscious intention to work for change. Carter Andrews reiterated Lee’s distinction between diversity and inclusion in her remarks, saying, “Diversity and inclusion are different. This city prides itself on being diverse but it is not enough to have different bodies in the city space. Are you really including people who are culturally different? And I think that’s where we are missing the mark.” She called the absence of black teachers a form of white supremacy and institutional racism. Bacon said this kind of thing holds East Lansing back by locking up existing potential. Carter Williams essentially agreed in later remarks, saying that it was not only black young people who suffer when they have no representation among their teachers, but also white young people who would learn and grow from such experiences. In his opening remarks, Mayor Mark Meadows had read from a speech, “The Other America,” by Dr. Martin Luther King, Jr., which he heard at Grosse Pointe High School on March 14, 1968: “I do not see how we will ever solve the turbulent problem of race confronting our nation until there is an honest confrontation with it and a willing search for the truth and a willingness to admit the truth when we discover it.” That, Meadows said, was as true today as when King spoke the words 50 years earlier. As noted above, last night’s panelists provided a number of specific interventions that could help improve the situation here. Speaking to what people can do individually, Bacon urged those present to make clear racist remarks are unacceptable to them – to say, “not in my presence.” Shutting down racist remarks, he said, stops “the multiplier effect,” where the assumption is that such things are acceptable to pass on like gossip. There are a number of institutional initiatives in the works to try to move things forward. As noted above, Hosey is working on curriculum reform and Simon noted that the ELHS Black Student Union is also doing similar work at ELHS. Simon also said the Black Student Unions in area districts are coming together to work as the Greater Lansing Black Student Union Coalition. After the discussion, East Lansing Council Member Aaron Stephens told ELi there are also plans in the works for having another community discussion on race in the fall, and not waiting a full year to come back to this kind of dialogue. The current City Council has indicated strong support for action, with Mayor Mark Meadows and Council Member Shanna Draheim specifically praised by Hosey for having taken real action after he spoke with them months ago. Along with several members of the East Lansing School Board, the event was attended by many members of City staff, including Police Chief Larry Sparkes, Deputy Police Chief Steve Gonzalez, City Manager George Lahanas, Deputy City Manager and Director of Planning Tim Dempsey, Director of Public Works Scott House, Director of Human Resources Shelli Neumann, and Library Director Kristin Shelley. Before closing out the discussion, Carter Andrews urged white parents to talk to their kids about their white-skin privilege, and noted that events like last night’s are exhausting to black people, because they are obligated to relive traumatic events in retelling them. Bacon echoed this in his earlier remarks, noting that white people who attend such events often feel better about themselves after them. Meanwhile, the discussions make vivid, all over again, to everyone black in the room just how real their perceptions of racism are. Sam Hosey (Alex's father) recorded last night’s event and has made it available on Facebook in two parts: Part 1 and Part 2. Photos above were provided by Sam Hosey, Aron Sousa, and Alice Dreger, and the map was obtained with the assistance of Kristin Shelley.